New images from NASA's New Horizons Pluto probe suggest the used-to-be-a-planet possesses methane-frost-covered mountains. Sharp-eyed Reg readers will have noticed that some of the mountains are a rather different colour to the prevailing background. Current thinking is that those white, shiny, patches are ice. 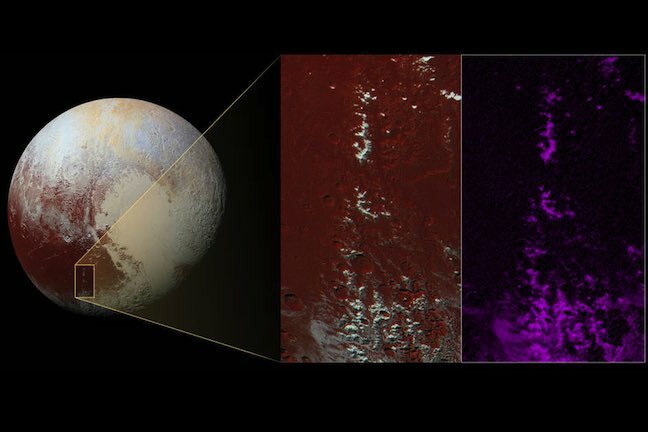 The third of the images atop this tale depicts an image captured by New Horizons' Ralph/Multispectral Visible Imaging Camera. The purple indicates high concentrations of methane. NASA thinks the similar coverage for the white patches and the prevalence of methane further bolsters its methane-ice-capped mountains theory. All of which could mean that the eyeless horror known as “snowboarders” might one day find reason to visit Cthulhu Regio.